ADI is calling on the organisers of the Enstone Annual Show to halt plans to feature three bear cubs at the event, which is being held at the village’s sports and social club located near Chipping Norton in Oxfordshire this Saturday, 23 August 2014. The bear cubs are being supplied by Chipping Norton-based Amazing Animals, which is a major supplier of animals for television, advertising and films. ADI has previously gone behind-the-scenes at the company and revealed brutal training techniques, animals exhibiting unnatural and repetitive behaviours, and barren conditions. When approached by ADI, the organiser of the Enstone Annual Show was unable to provide any details about the bear cubs or what provisions would be made to safeguard the animals’ welfare and public safety. ADI has since been informed by the council that the hand-reared bears will be housed in a 20x10x8ft enclosure with a water pool and hide box. 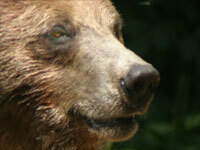 The bears will be present at the event for 2 hours with a vet in attendance and a 3ft safety barrier will be in place. ADI has particular expertise in the use of animals in the entertainment industry and our ongoing studies have highlighted the abuse, deprivation and suffering inflicted on animals used for this purpose. Our undercover investigations at establishments in the UK and around the world have shown that, in the main, any discipline or abuse of captive animals used for entertainment tends to occur behind the scenes, while the animals are being trained or kept isolated in their cages. This makes it almost impossible to ensure that a performing animal has not suffered during a lifetime of training. Other studies have identified that, in captivity, animals are deprived of all the normal, social and mental stimulation that they would enjoy in the wild. They live in barren environments, where they remain until required for a performance. They are trained to do tricks and their compliance may be gained through a withdrawal of food, water or affection. Bears are inquisitive animals, known for their enjoyment of anything new and interesting, and for exploring great distances each day in the wild. Using them for entertainment compromises their welfare; even in zoos, bears have been found to suffer the adverse effects of captivity. Using wild animals for entertainment may appear harmless, but it is certainly no fun for animals like bears who are highly intelligent and have very specialised needs. ADI investigations have shown the suffering these animals endure, and we urge the organisers to pull the bear cubs from the Enstone Annual Show and refrain from having wild animals at future events.